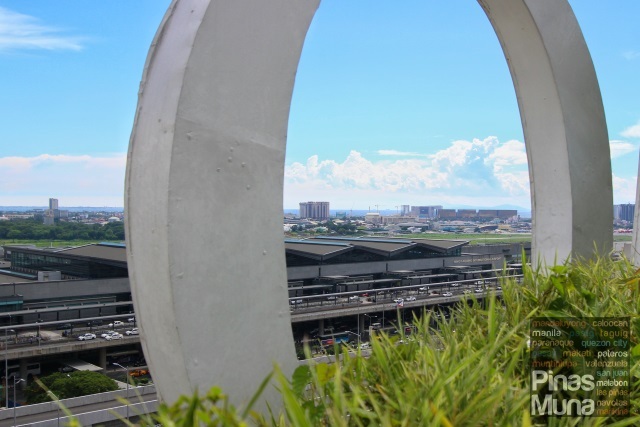 Belmont Hotel Manila is a first class hotel located at the Newport City Complex, right across the Ninoy Aquino International Airport (NAIA) Terminal 3 in Pasay City. 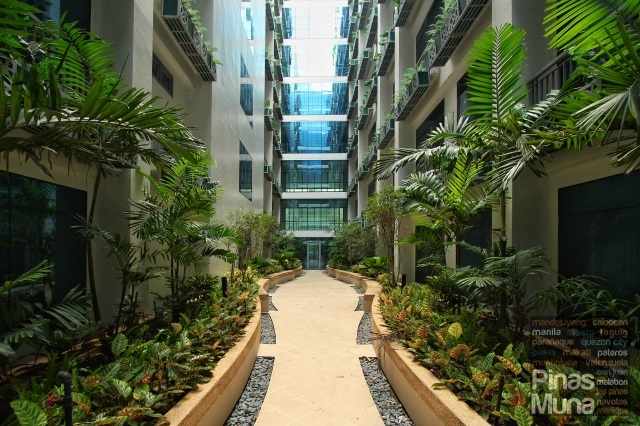 The hotel has 10 floors which house a total of 480 guestrooms. 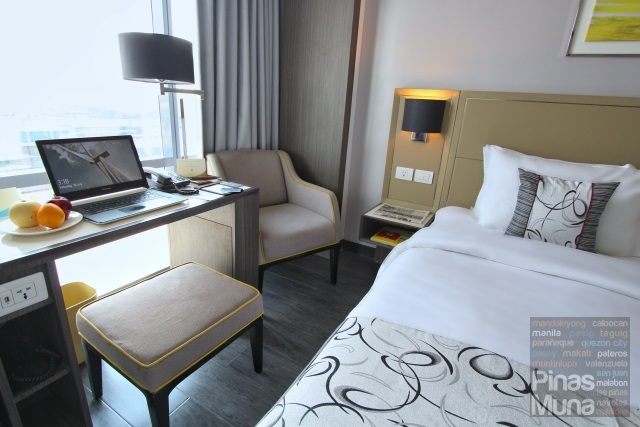 Belmont Hotel Manila is perfect for business travelers, as well as leisure travelers and staycationers. The hotel also stands right across the Marriott Grand Ballroom which makes it the perfect base for participants of meetings, conferences and other events. 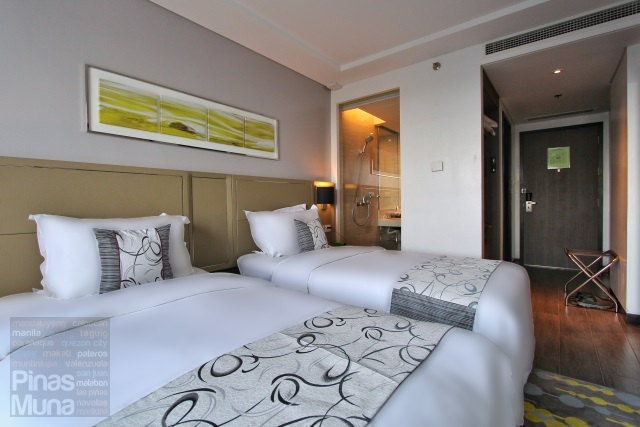 Belmont Hotel Manila is also perfect for passengers on a layover due to its close proximity to the airport. In fact, an air-conditioned foot-bridge connecting Terminal 3 and Newport City Complex is currently being built and is expected to be finished by the end of this year. 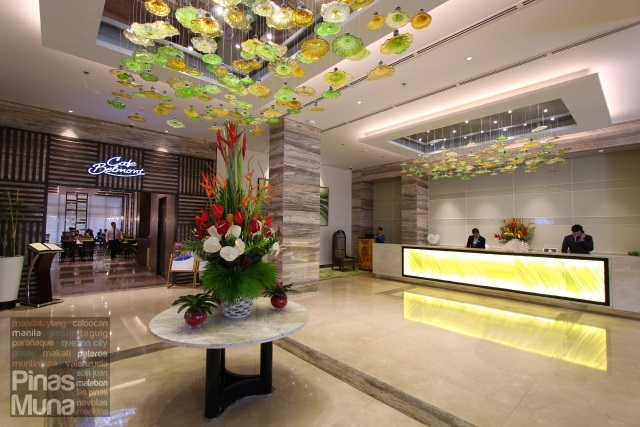 The hotel's reception area has a very size, with generous space that can accommodate multiple guests. The front office is manned by very well groomed reception staff. Service was prompt. Check-in followed the basic guest registration process with very little time spent per guest. Check-in was generally quick, except when a big group arrives from the airport. 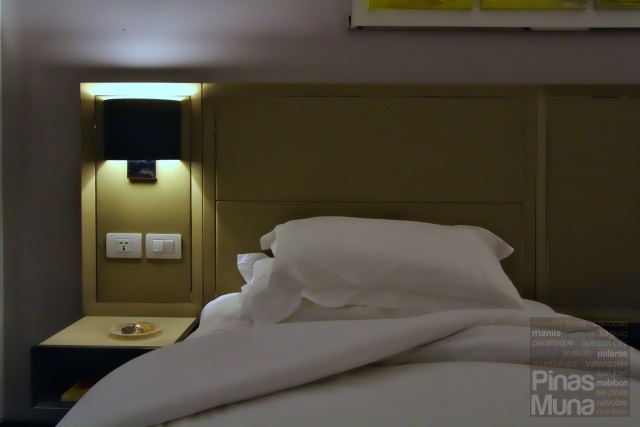 We spent a weekend in a Deluxe Room during a Staycation at Belmont Hotel Manila. The Deluxe Room is the next higher room category following the Superior Room lead-in category. It measures 23sqm and is available in two bed configurations: Queen or Twin. 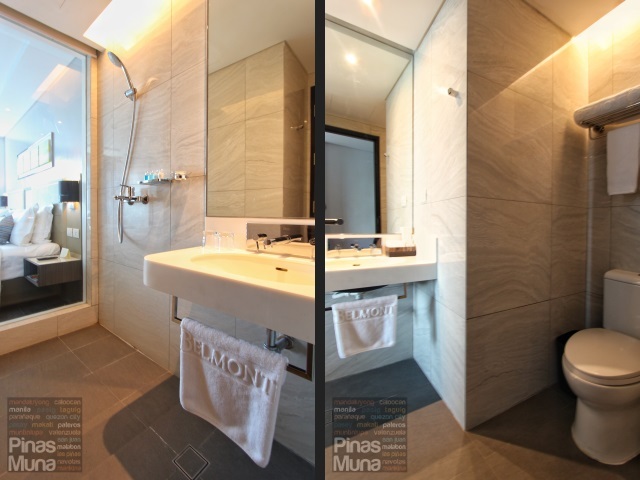 Although it is a little smaller than the 25sqm standard room size set by the Department of Tourism for four-star hotels, the Deluxe Room boasts of room amenities that one can expect in four-star and five-star hotels. The bed for example features a pocketed spring mattress with a thick mattress topper. The bed as well as the duvet are covered with high-thread count cotton linens. The pillows are fluffy and encased is clean pillow cases. 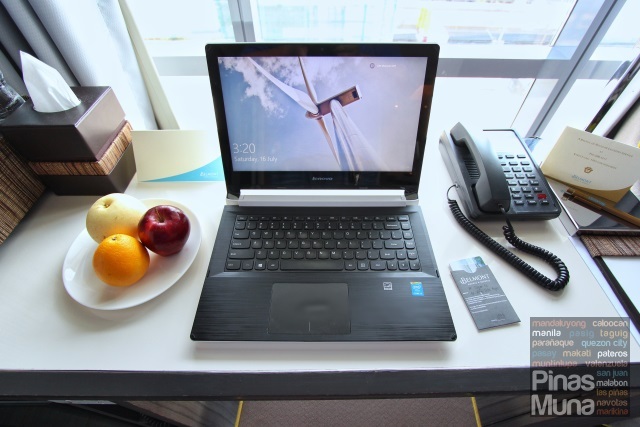 The work station fits my 14" laptop as well as the in-room telephone, some stationery and the welcome fruits. There's also a stool placed under the table. Power outlets with universal and USB sockets are conveniently located in an easily accessible compartment right under the table. There's also a fully stocked minibar as well as coffee and tea making facility. Complimentary bottled water are also provided. 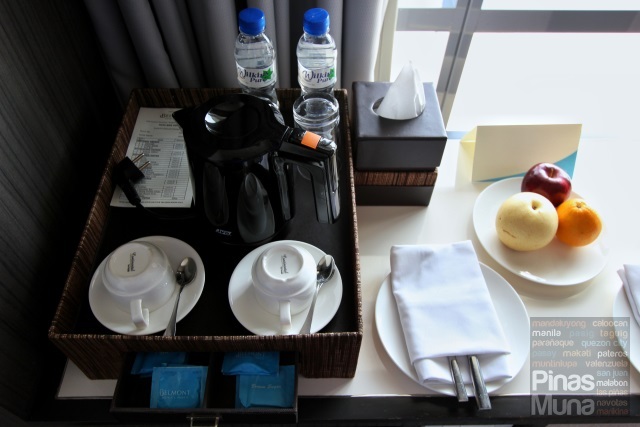 In-room dining is available 24 hours, a premium service you can only experience in four-star and five-star hotels. In-room dining menu is provided per room. 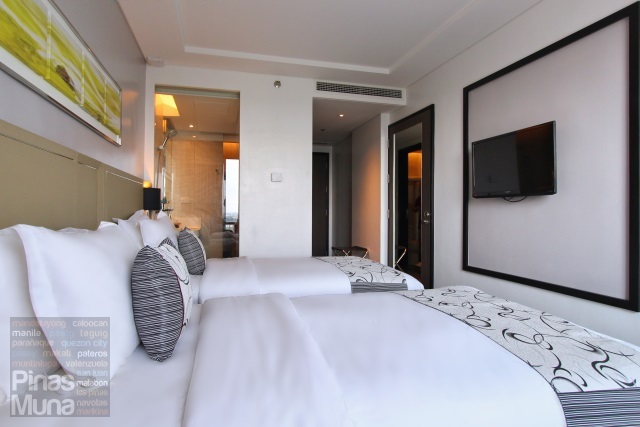 The room has its own individually controlled air-conditioning unit. Other room amenities include a 32-inch LED TV with local and international cable channels. There's also complimentary WiFi internet access inside the room and common areas of the hotel. Username and password will be provided upon check-in. There's also an open shelf wardrobe with wooden hangers for delicate clothes. It has two sliding compartments while the topmost compartment houses an electronic safe which is big enough to fit a 14-inch laptop. Bathrobes and room slippers are also provided per guest. Limited room space was smartly used to build an en-suite bathroom that includes a shower area, a lavatory and a toilet area. 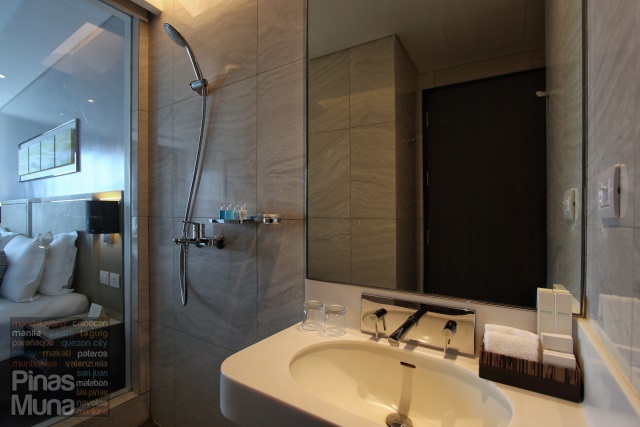 A glass wall separates the bathroom from the bedroom which allows guests to continue watching TV while taking a shower. For privacy, blind can be rolled down from the bathroom ceiling to conceal the shower area. Hot and cold water is available at the shower area and at the lavatory. Water pressure was generally strong during our stay. 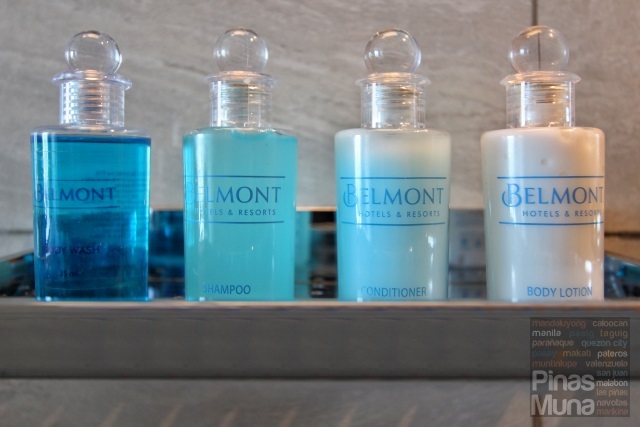 Belmont signature bathroom amenities are also provided. Towels were clean and smelling fresh. One drawback is that the toilet is not installed with a bidet. 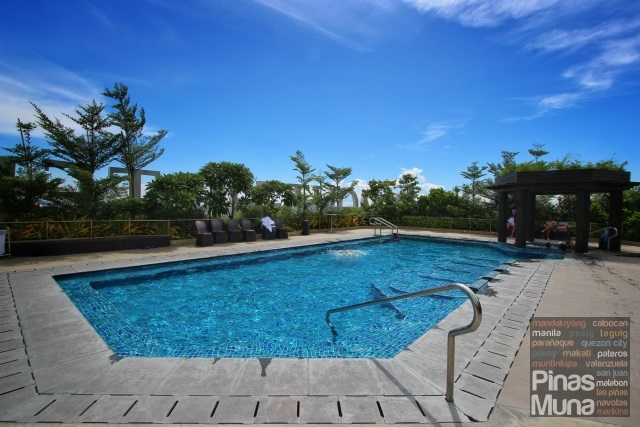 While on a Staycation at Belmont Hotel Manila, one of the relaxing and fun activities you can enjoy is swimming at the rooftop outdoor swimming pool. It also has an attached jacuzzi and a separate kiddie pool. There is a lifeguard on duty. You can also order drinks and light snacks at the pool bar. The rooftop outdoor swimming pool and the pool bar are open everyday from 7:00am to 10:00pm. 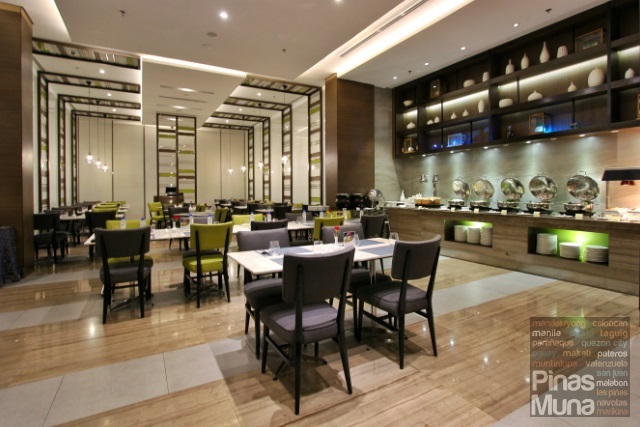 If you are spending a weekend staycation at Belmont Hotel Manila, you would be happy to know that its all-day dining restaurant, Cafe Belmont, offers a themed dinner buffet every Friday and Saturday for only P900.00 nett per person. 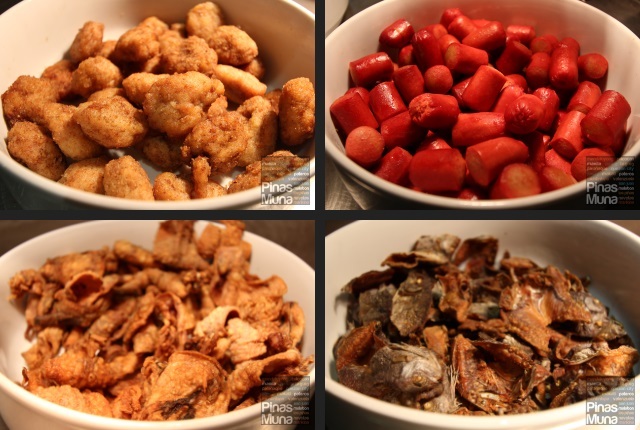 Last July & August, we were able to sample their South East Asian Night buffet offering. During the whole month of September, the theme was Central Luzon Fiesta. 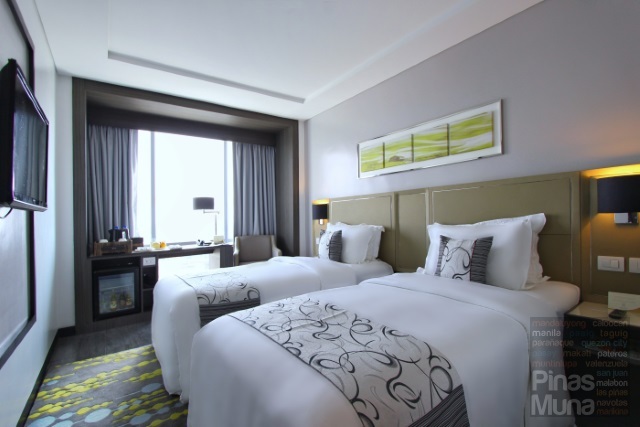 Turndown service is also available in all Deluxe category guestrooms where in a maintenance staff will turndown the bed's linen, similar to making-up the bed, and preparing it for use at night. Complimentary chocolate cookies are also left at the bedside table as part of the turndown service. 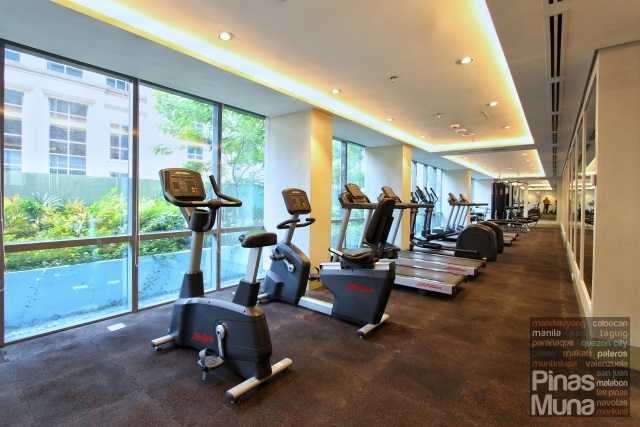 Located on the second floor of the hotel is the gym which is fully equipped with workout machines and free weights for weight training. There is a dedicated gym instructor available on duty to assist you with your work out. 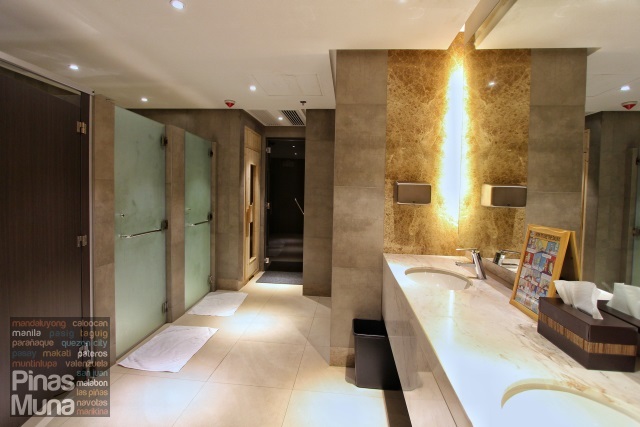 The gym also has a men's and a women's bathroom with a number of available shower cubicles, steam room and a sauna room. The bathroom is clean and well-maintained. The sauna is very spacious and looks very modern. Other morning activities you can enjoy is jogging around the Newport City Complex. Roman Catholic families may also attend the Sunday morning mass at the nearby Shrine of Saint Therese of the Child Jesus. 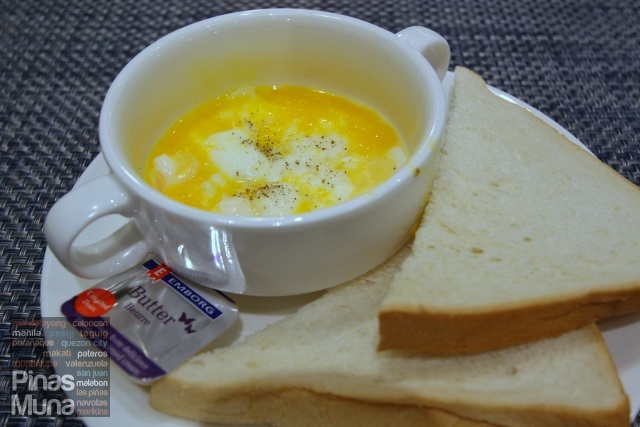 An overnight stay at Belmont Hotel Manila comes with complimentary buffet breakfast for two persons at Cafe Belmont. Breakfast starts as early as 6:00am and the restaurant starts to get busy by 7:00am. 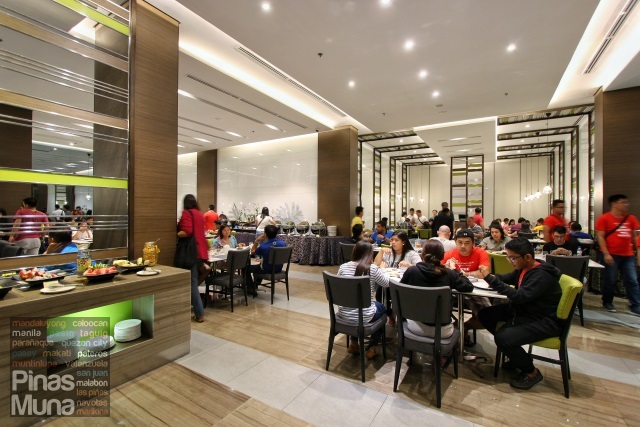 Although the restaurant can accommodate up to 100 guests, it can still get very crowded especially during a weekend. Foodwise, the buffet spread is constantly being refilled and you seldom see empty dishes. The selection of food is mainly Filipino with some Asian and Western items. There's a congee station where you can choose your toppings. I had mine topped with chicken, green onion, toasted garlic, and hard boiled egg. There's also a toast and bread station with jams and butter. 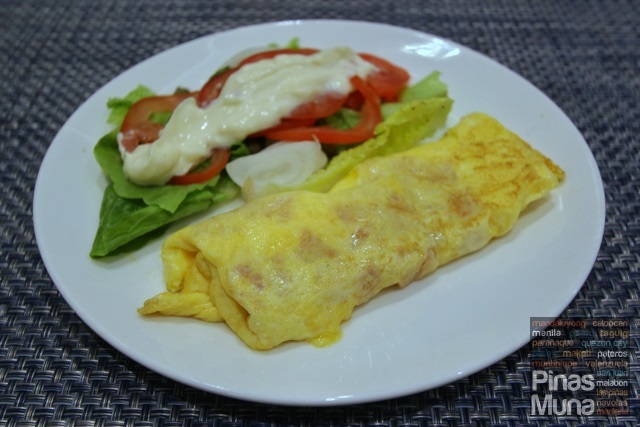 At the egg station, you can request for omelet, scrambled eggs, sunny side up, hard boiled, soft bild eggs, cooked a la minute. I had soft boiled eggs topped with butter with my bread toast, and also had ham and cheese omelet with my salad. The main dishes include plain and garlic fried rice plus six different viands. 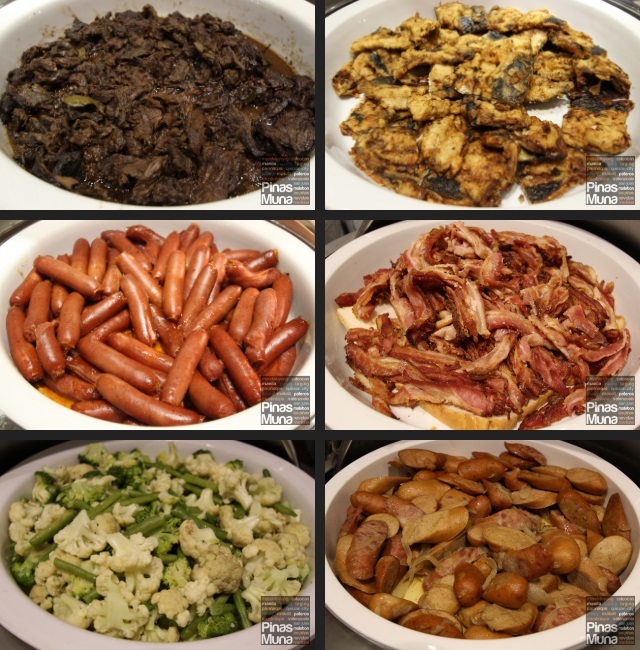 During our stay, there was beef tapa, daing na bangus, longanisa, bacon, buttered vegetables and sausages. There's also danggit and fried squid. Kids and kids at heart will surely love the chicken nuggets and the hotdogs. There's also cereals, some fresh fruits and yogurt. Free flowing coffee and tea are also served during breakfast. If you are not a morning person and would just prefer to have coffee and stay in bed the whole morning, you can book a room rate without breakfast and just have a lunch after check-out at 12:00nn. 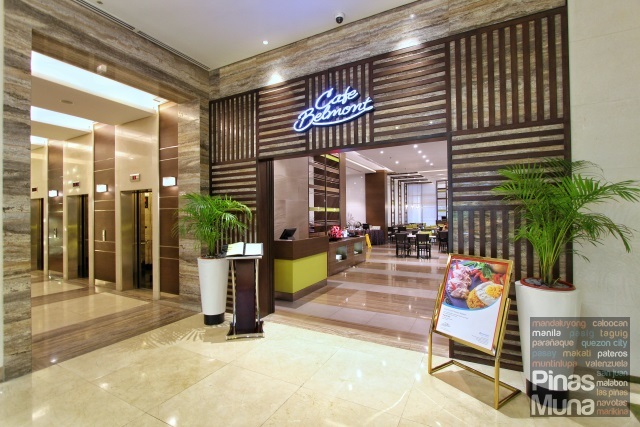 Cafe Belmont serves a la carte dining starting at 11:00am onwards. 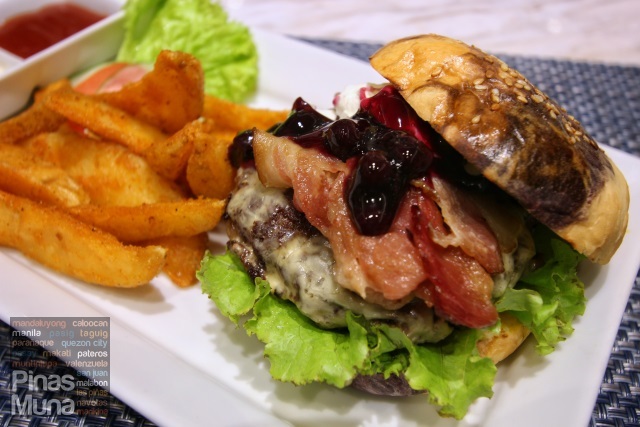 If you feel like having a sandwich or a burger for lunch, we highly recommend that you try their signature Belmont Burger which is basically a thick beef burger patty on a bed of lettuce and tomatoes, topped with melted cheese, layered with caramelized onions, bacon strips, cream cheese and blueberry confit. 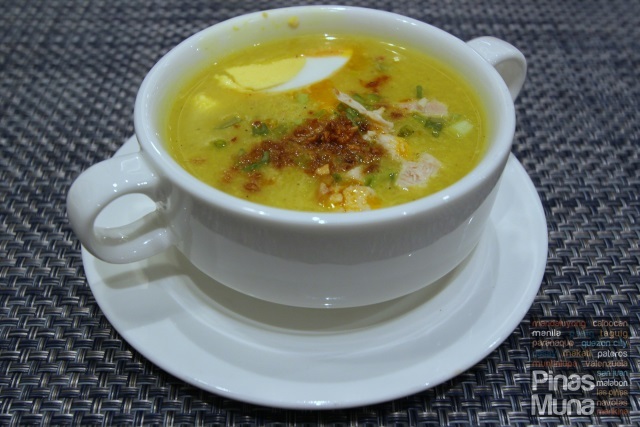 Belmont Hotel Manila takes pride in their Filipino dishes created by Chef Dean Manalo who is a native of Pampanga and is known for cooking dishes in their traditional, laborious and labor intensive way. 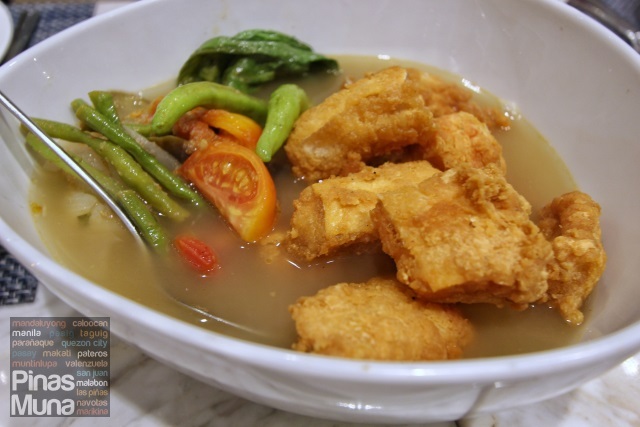 The Sinigang na Salmon Belly sa Miso for example does not use instant tamarind soup powders. Instead, chef uses fresh tamarinds as a souring agent for his miso broth. 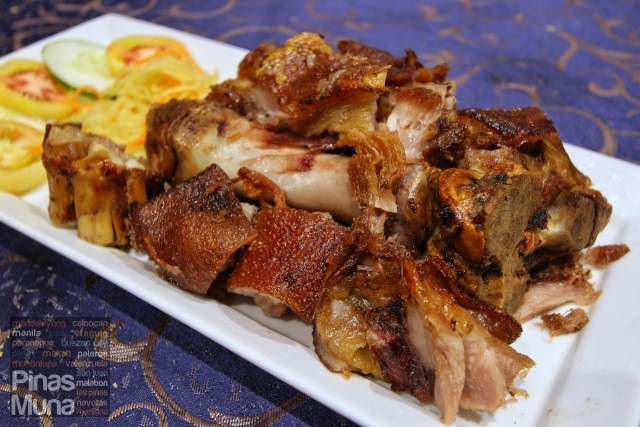 The Crispy Pata also did not take a short cut. The pork leg was slow boiled for hours and hours and is then fried over high heat to achieve that crackling crispy texture and sound in each bite. The meat was super tender and really went well with the soy-vinegar-garlic dipping sauce. No one does Kare-Kare anymore just like in the old days when peanuts were roasted and pounded to become a paste, which is then turned into a silky broth for this Filipino beef dish. The meat was very tender while the vegetables were crunchy and sweet. 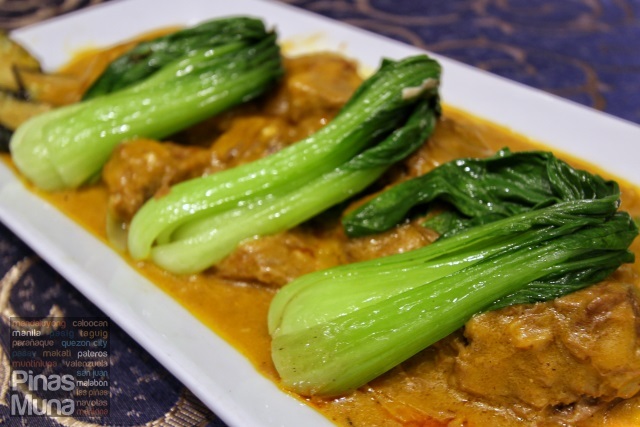 The Kare-Kare also had a hint of smokey flavor which came from the pan roasted rice which are then pounded and mixed with the peanut sauce. Overall, we enjoyed our weekend stayation at Belmont Hotel Manila. Although the rooms are a bit small, the room amenities are top of the line. Most importantly, the bed was very comfortable and the shower has strong water pressure. The breakfast also had a good selection. There are also plenty of activities available to guests, plus other leisure activities guests can enjoy at Resorts World integrated resort.